Beginning 1 October this year, the country has waived visa requirements for visitors from Japan and South Korea for one year, as a trial run. Visitor growth from these two countries had been stagnating for a while. In 2016, Japanese arrivals topped 100,000 and grew to only 101,500 in 2017. In the first half of 2018, Chinese tourist numbers grew by 36 percent. 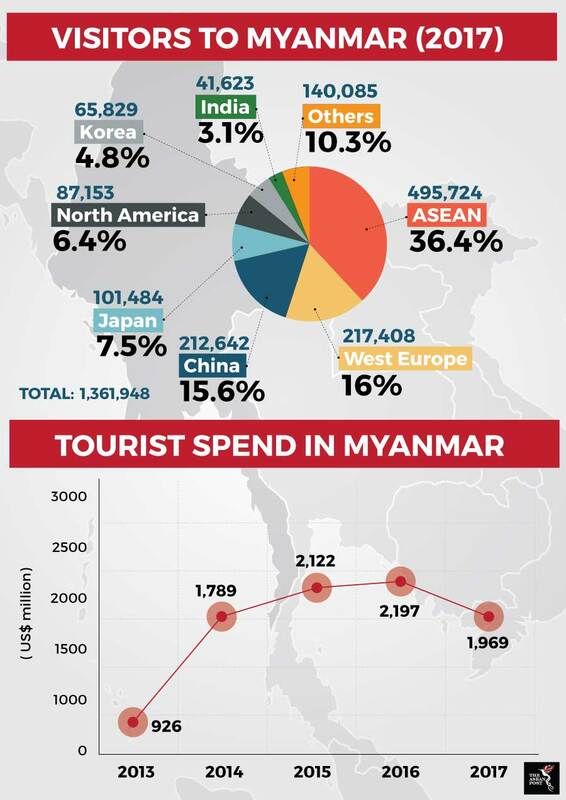 Visitors from China, Macau and Hong Kong do not share the same preferential treatment: they are instead offered visas-on-arrival at airports in Yangon, Mandalay and Naypyidaw for the sum of US$50 per tourist. They currently have to apply for visas in advance. The revised visa policies are also intended to attract investors to Myanmar,as a new Companies Law there allows foreign investors to own up to 30 percent of shares in local companies and to enjoy up to seven years of tax-free operations. The Labour, Immigration and Population Ministry of Myanmar dropped a fly in the ointment by requiring visitors to carry US$1,000 in cash to demonstrate their spending power. It drew widespread criticism from the tourism industry and even the Hotels and Tourism Minister, U Ohn Maung. Tour operators were reported as saying the US$1,000 regulation would affect tourist arrival numbers and without clear directives on policy details, they were unable to plan their marketing campaigns effectively. A week later, the government backtracked on its decision when the Hotels and Tourism Ministry announced a “suspension” of the rule ahead of an official announcement from the immigration ministry. Myanmar’s tourism industry began to flourish after 2010 when Aung San Suu Kyi was released from house arrest. She had been in and out of detention for 15 of the past 21 years and became a global icon for human rights. At the time, Myanmar was undergoing political reforms to come out of international isolation. The country had been run by the military since a coup d’etat in 1962 and placed under sanctions by the United States (US) and most European governments. The Myanmar government ran an election in 1990 in which Suu Kyi’s National League for Democracy (NLD) obtained an overwhelming victory. However, the party was never allowed to come into power. In 2008, the government introduced a new military-drafted constitution which guaranteed 25 percent of seats in parliament to the military. As it was seen as a step towards democracy, the European Union (EU) was willing to consider lifting sanctions on the country. A general election was held on 8 November 2015 and the NLD won with an absolute majority. Suu Kyi was installed as State Counsellor. This coincided with a peak in tourist arrivals of 4.68 million visitors. Of these, 3.4 million arrived on land through the country’s five border gateways. However, the negative publicity from the ongoing plight of the Rohingya people has had a negative effect. Violence against them in the Rakhine state forced more than 600,000 refugees to flee to neighbouring Bangladesh recently. Suu Kyi has been coming under fire since for her silence and inaction throughout the crisis. She was also criticised for her remarks in 2012 that she did not regard the Rohingya as Myanmar citizens. The Rohingya issue practically wiped out tourism prospects from the West. Tourist arrivals plummeted to 2.9 million in 2016 but recovered slightly to 3.4 million in 2017. This is still far fewer than some of Myanmar’s smaller and less developed ASEAN neighbours. Landlocked Lao PDR, with no beautiful beaches like Myanmar’s welcomed 3.9 million visitors. Cambodia, with ancient temple ruins matched by Myanmar’s own spectacular temples, had 5.6 million visitors. Despite the setback, the government there is still sticking to its 2013 Tourism Master Plan. It aims to achieve 7.5 million tourist arrivals by 2020. This article was first published by The ASEAN Post on 3 August 2018 and has been updated to reflect the latest data.